“No they didn’t!” I maintained. “They gave me a megaphone to trumpet artists’ rights and that is what I have been doing ever since. They tried to distract us but it blew up in their face. The T-shirt Art Harvest Fest is this coming weekend (Friday Sept. 30 – Sunday Oct. 2nd, 2011) and it is bigger than ever even as I am fighting health issues and we are fighting their intended legal distractions. The Ravenswood Art Walk (RAW) is at the same time and it is well promoted. Come meet the Native Artists exhibiting with the RAW on Saturday and Sunday. We have a map with our Fest on it for the Chicago Critical Mass on Friday and the weather looks to be great all weekend. The Art Patch Project is the more proof that our voice for artists’ rights is steadily increasing even as they try to silence our movement with a felony charge and two years of legal interference. The Art Patch Project is now over 180 designs strong and growing. We are preparing exhibits in other cities. It still has just the tiny tip of its iceberg showing with its big history still to come when artists begin to flock to its call. See the latest designs and pick up new art-patches before they are all given away. Hint – you best come on Friday to get a good crack at the latest art patches. They are fast becoming collectors items. YES – Free Music and art will rule at the American Indian Center Friday, September 30th through Sunday October 2nd at 1630 W. Wilson Avenue in Chicago. The Art Patch Project will distribute free art patches all weekend. SPEAKOUT on Saturday from 2-5 on the Illinois eavesdropping law. The public and people affected will be invited to speakout on the Illinois eavesdropping law with their statements to be video recorded and uploaded to Youtube to raise awareness of this important issue. Volunteers are especially needed on Friday from 6-11pm when we expect the Chicago Critical Mass to arrive. We need help to watch bikes locked up outside the building. Help us make the Chicago Critical Mass welcome by volunteering to watch their bikes for us. Call 773-561-7676 if you can help for a few hours to make this event rock easy. Several weeks ago Circuit Court Judge David Frankland said that Michael Allison had a First Amendment right to record the police officers and court employees and dismissed all the charges against him. Judge Frankland ruled the Illinois eavesdropping law is unconstitutional. Just before that the ACLU appeared in front of the 7th Circuit Court of Appeals arguing for their federal lawsuit against Cook County State’s Attorney’s Office and Anita Alvarez, to prevent her from enforcing the Illinois eavesdropping law against individuals who audio-record police in public. Today this issue is a hot national issue while 22 months ago when I was first charged with eavesdropping on the police no one had heard about this law. We changed that! Distraction? I doubt it. By December we will be suing the City of Chicago over the constitutionality of the peddlers license just as was our initial intention. When our artists’ rights lawsuit is lodged it will gather the attention it deserves because of everything we have been through. LATEST Nancy Bechtol Court Video – Judge later said I can’t argue the “exemption i” defense to the jury. The current issue of the People’s Tribune may be read on line here. Lew Rosenbaum has written an article summing up the fight for public education in Chicago, and the entire issue focuses on the national battles on public education, with articles from Los Angeles, Atlanta, Southern Illinois and about using the example of the Triangle Fire in the classroom. 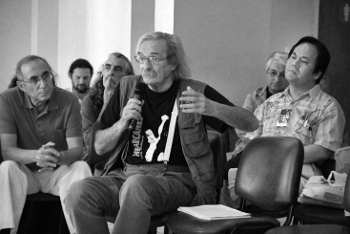 Jack Hirschman contributes an article on the World Poetry Movement. 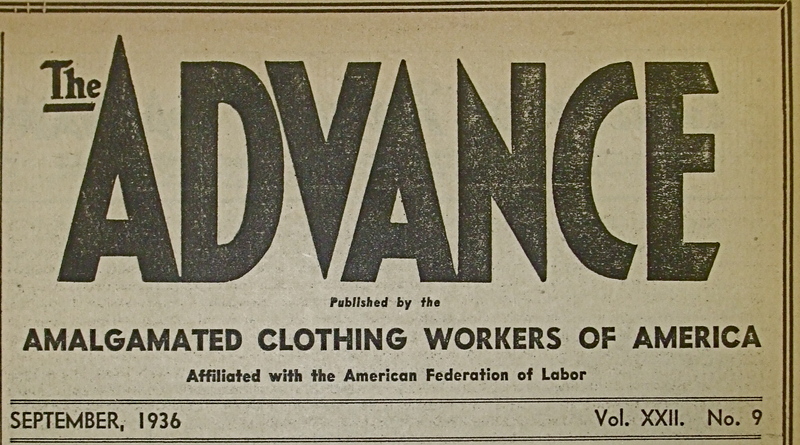 Published in the September, 1936 issue of The Advance, the newspaper of the Amalgamated Clothing Workers of America (ACWA). 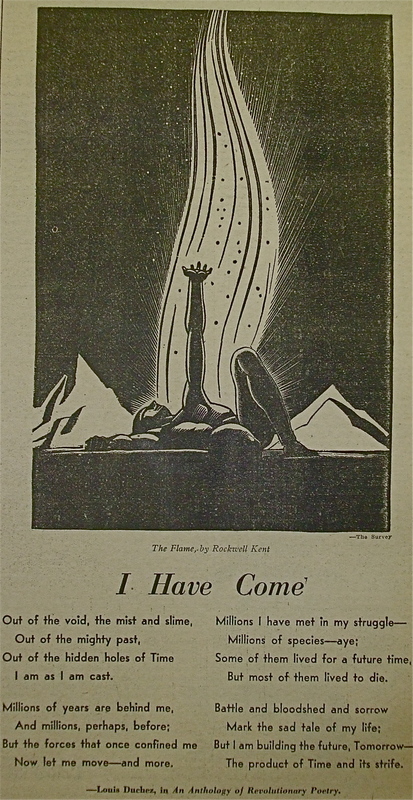 The artist is Rockwell Kent, the poet Louis Duchez, the poem was published in An Anthology of Revolutionary Poetry. Mark Vallen’s Art On The Line: Shifra Goldman, Presente! 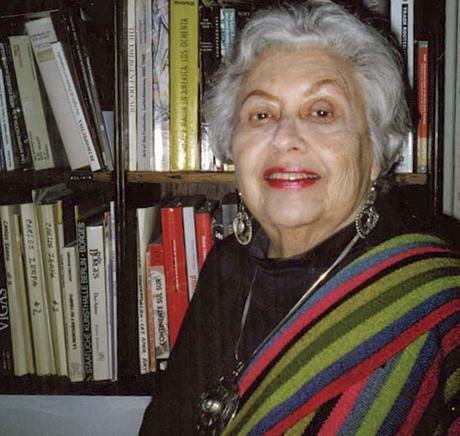 Visionary social art historian Dr. Shifra M. Goldman died on the afternoon of September 11, 2011. She was an arts advocate, activist, researcher, critic, and author who dedicated her considerable energy and intellectual prowess in advancing an understanding of Chicano, Mexican, and Latin American art. I learned much from her extensive writings, and over the years I was privileged to meet with her on several occasions, encounters that always resulted in the liveliest conversations pertaining to socially conscious art and the role of the artist in society. hour-long intensive lecture on the life and times of Adolfo Mexiac (Meh-she-ack), the artist who in 1954 created the original woodcut print. This initial encounter with Shifra left me with a lasting impression of her towering intellect and profound enthusiasm for the arts. 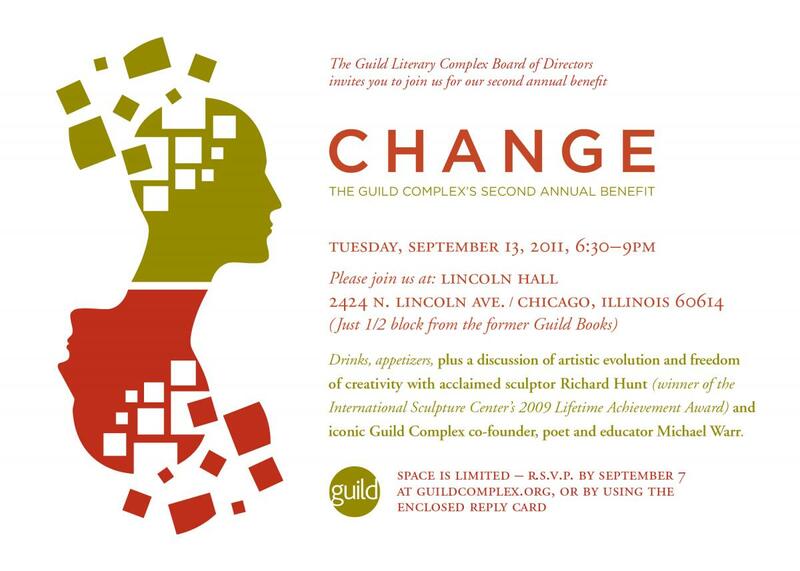 This is a reminder that the Guild Literary Complex Benefit is a week from this Tuesday, on Sept 13, 2011. The complex is hoping to receive responses/reservations by Wednesday (9-8) so that they can plan properly, but given that only one week remains, the main thing is that it is not too late to reserve your place. The event will have terrific food and, more importantly, will host a conversation on creativity between acclaimed sculptor Richard Hunt and poet Michel Warr. Richard’s spectacular and monumental work, much of it created just steps from the site of Guild Books in his studio on Lill Street, is displayed in public places around the USA. Michael is the founding director of the Guild Complex and a poet of remarkable powers. Their exchange promises to be one of the cultural highlights of the year! If you don’t know about it already, the Guild Complex was born in the creative space created at Guild Books. The Complex was the umbrella under which the Chicago Labor & Arts Festival developed. The Complex promotes literature and sponsors readings & other literary events throughout Chicago, particularly among historically under-represented groups. I have been on its board since its inception. The first level of giving to attend the benefit is $75. If you can’t attend all donations are welcome. I’ve attached an invitation. Please feel free to forward it to anyone who is interested in art and literature in Chicago. The sooner the better, as the event has limited seating. Please respond online and Ilook forward to seeing you there! On Friday, September 2, at 11:00 a.m. at the corner of Clinton and Jefferson streets in Ottawa, Illinois, a statue of a young woman holding flowers in one hand and paintbrushes in the other will be unveiled. She is the symbol of the Radium Girls, the young women who worked in the clock and watch factories dotting the Illinois Valley in the first half of the 20th century. This was the era of “glow in the dark” watch and clock dials, painted with deadly radium. Many of these workers died from the effects of putting their brushes in their mouths countless times a day to sharpen the points, as the companies trained them to do. 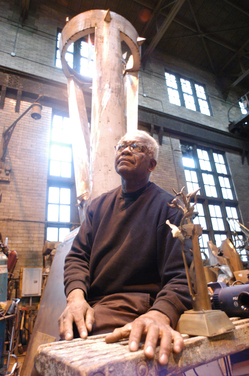 The statue will stand on the site of the Luminous Processes factory in Ottawa at Clinton and Jefferson. The City of Ottawa, community groups and local unions worked together to raise the funds and assure the successful completion of this project. Laborers Local 393, an affiliate union of the ILHS, has donated many member volunteer hours to prep the site where the statue will be placed. It all started when student Madeline Piller made the Radium Girls the subject of her junior high history fair project, and then never forgot their story. Her father Bill Piller is a sculptor and she enlisted his help to honor these women, many of whom were laid to rest after their untimely deaths in the Catholic cemetery just outside of Ottawa. A Geiger counter passed over these graves will still register the presence of the deadly radium poison that took their lives. The Ottawa Radium Girls were not alone. Radium-painting factories were also operating in New Jersey and Connecticut. In her book Radium Girls, Woman and Industrial Health Reform, 1910-1935, Central Michigan University historian Claudia Clark extensively documents the suffering of these young women and the fight they and their families mounted to obtain proper compensation from their employers. These efforts for justice helped spark needed legislation concerning occupational diseases’ and workers compensation laws throughout the country. This Labor Day weekend, we commemorate the contribution made by the struggle of these young women to the health and safety protection of all working people. The video Radium City (excerpt) movingly recounts this tragedy. For the complete video (almost 2 hr documentary), click here. A month later, the World Poetry Movement has been joined by 86 international poetry festivals and 465 poets from 98 countries from all continents. Recently the World Poetry Movement has been joined by the “100,000 Poets for Change” project (www.100TPC.org), a bold initiative by poets Michael Rothenberg and Terri Carrión, in California, who have proposed the implementation of a worldwide poetic action, next September 24th, 2011 in 350 cities worldwide. World Poetry Movement calls on all its members, poets and international poetry festivals, to plan, develop and spread poetic actions and Simultaneous poetry readings, across the planet, next September 24th, 2011, to consolidate our organizational process, making a formidable display of poetic power possible in the world, in hundreds of cities and villages on Earth.